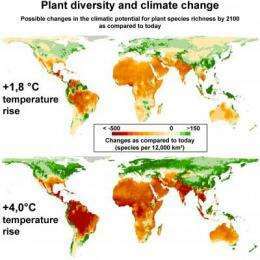 In the coming decades, climate change is set to produce worldwide changes in the living conditions for plants, whereby major regional differences may be expected to occur. Thus today's cool, moist regions could in future provide habitats for additional species, and in arid and hot regions the climatic prerequisites for a high degree of plant diversity will deteriorate. This is the conclusion reached in a new study by scientists at the Universities of Bonn, Göttingen and Yale, and published in the Proceedings of the Royal Society London. Dr. Jan Henning Sommer of Bonn University´s Nees Institute for Biodiversity of Plants asserts, "climate change could bring great confusion to the existing pattern of plant diversity, with scarcely predictable consequences for our ecosystems and mankind". The potential impact of climate change on global plant diversity has now, for the first time, been quantified and modeled on a regional basis. The researchers have investigated the numbers of plant species to be found in different regions under current climatic conditions, and the subsequent interrelationship they uncovered has now been applied to 18 different climate change scenarios for the year 2100. However, the study does not permit any predictions regarding the degree to which the biodiversity of any given region will, in fact, adapt to new conditions or, in other words, whether additional species will migrate into favoured regions, or whether disadvantaged areas will in reality suffer mass losses of species. "That would be fortune-telling. The adaptability of species and their interactions in the ecosystem can, like human landuse, exert great influence on their distribution. This is a field about which we still know far too little", Sommer explains. Nevertheless, the published results do provide an important pointer to the likelihood of the scales of immigration or losses to be expected in given areas. It is possible that the worst effects of global warming on plant species numbers could be felt in the tropical Amazonian rain forests in South America. 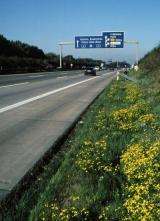 For Germany and other temperate regions worldwide, on the other hand, scientists are expecting future climatic conditions which will promote the provision of habitat space for an increased number of species. "But this can scarcely be described as a gain as the intensified redistribution of plant species will promote worldwide uniformity in the regional composition of species at the expense of unique species which have adapted to special habitat conditions", says Sommer. And as a result, globalisation would also come to the plant kingdom. In their study, the researchers have emphasised the clear division of our planet into two parts as regards the impact of climate change on plant diversity. "Additional capacity for plants species richness could be created everywhere where today cool and moist climatic conditions prevail", says Dr. Holger Kreft, the young research scientist from Bonn and co-author of the study, who has meanwhile assumed an appointment as junior professor at Göttingen University." On the other hand, in areas which today have a hot tropical or sub-tropical climate the prerequisites for high species numbers will deteriorate". This division also has a political dimension: favoured areas coincide largely with the industrialised nations, who are responsible for the majority of global warming due to their high amount of greenhouse gas emissions. The study also points clearly to the consequences of a half-hearted climate policy. Should the global temperature rise by 1.8°C with respect to the year 2000, then the proportion of favoured and disadvantaged regions in terms of species richness would still remain in balance. "Even if the climate protection goals agreed in Copenhagen are achieved, we would still tend to be heading for a rise in temperature of up to 4°C", says Sommer. In this case, the projected losses of capacity for plant species richness would considerably exceed possible gains in other regions. "Politicians throughout the world should be paying greater attention to the impact of climate change on biodiversity as this is the basis of our human existence", demands Professor Dr. Wilhelm Barthlott, Director of the Nees Institute and co-author of the study. He and his study group have been investigating global plant diversity for 15 years. Barthlott welcomes the fact that the United Nations has declared 2010 to be the year of biodiversity. "This was an important signal!". Borneo - the most species-rich area in the world! Quote: "the industrialised nations, who are responsible for the majority of global warming"
The usual BS call on this one. Life goes on. It just might not be the same as when you were a kid. Note the map is distorted w/ the large diversity decreases in the equatorial regions appearing to be a large area whereas the polar regions where there is a large increase appear to be only a tiny area. This is how information is cleverly distorted to get people to believe in this religious global warming silliness. Lots of simulations but scant or homogenized data. All very nice, except there is no global warming. The satellites and the ocean ARGO system show cooling. Only the "fudge factor"-ed land records show, or showed, warming. It is increasingly clear that land temperature records are manipulated and changed virtually constantly by the IPCC. Land based records are of such poor quality anyway that it is foolish to use them; they are hugely contaminated by massive population and economic growth. We should switch entirely to satellite and ARGO records, and them keep an eye on them to prevent the sorts of manipulations to which land-based records have been subjected.